The Adventure Bible Story Book: Deluxe Edition, written by Catherine DeVries, illustrated by Jim Madsen, is a wonderful children’s introduction Bible. This Adventure Bible Story Book is perfect for those who are just being introduced to the Word of God. It carries children through 23 stories found in the Old Testament and 28 from the New Testament. The stories are written in an easily understood format, so easy that even those beginning to embrace the joys of reading will have few, if any, problems understanding the narrative of each story. The illustrations in this publication are simply amazing. They bring to life the specific aspects of each Bible story. Not only do they enhance the story, they transform the entire reading experience. The illustrations for each story comprise of four to six pages, each illustration running across two pages. Another wonderful aspect of this Deluxe Set are the two listening CDs. For those too young to read, there is the opportunity to listen to the story as they examine the illustrations upon the pages while sitting at home or riding in the car. Either way, the listening CDs will provide a great beginning to what will hopefully be a lifetime of Biblical reception. 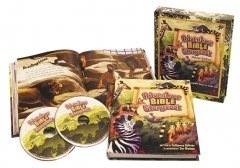 The Adventure Bible Storybook would be a wonderful addition to any family. Thus it is a recommended purchase. Nehemiah 9:31 But in your great mercy you did not put an end to them or abandon them, for you are a gracious and merciful God. God brought numerous warnings before the Israelites in regards to their wavering faith. He warned them to get back on track and begin to follow Him, as they once had done. On most occasions, they did retreat from their wrong ways and return to God, thus escaping His promised punishment. While they deserved to be punished anyway, God was merciful. They were blessed to experience the mercy of God, for if they did not, they would have experienced some very harsh punishments. We, too, are blessed to experience the mercy of God, for God has every right to give us exactly what we deserve because of what we have done. Now while God is merciful to us, we must also be merciful to others. Everyone makes mistakes. Everyone goes astray once in a while, and everyone deserves another chance. So as God is merciful towards us, we must extend the same out into this world. Lord, You are so merciful, and I am so undeserving. For that, I am grateful. Without the mercy of God, our lives would be completely different. Without the mercy of God, we would be in serious trouble. Without the mercy of God, we would be destined for an eternity in Hell. The mercy of God brings us into the presence of forgiveness, the forgiveness of our sins. Without the mercy of God, we would be lost in our sins and trapped within our transgressions. Without the mercy of God, we would not be able to experience the true transforming power of God. Have you experienced the mercy of God? Lord, please continue to show me Your mercy, even though I am an undeserving sinner. 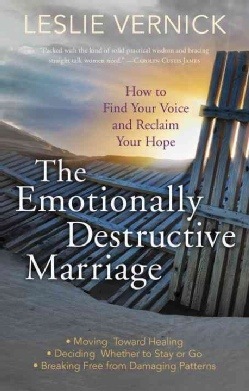 The Emotionally Destructive Marriage: How To Find Your Voice And Reclaim Your Hope, written by Leslie Vernick is a book designed to guide its readers into understanding the current state of their marriage and the possibilities that lie ahead. Dividing this book into three sections: Seeing Your Marriage Clearly, Change Begins With You and Initiating Changes In Your Marriage, Leslie offers great insight and understanding into the glorious journey called marriage. The three sections of this publication are divided in such a way that they offer a great pathway to understanding the current state of any marriage relationship. Readers will learn what it means to be in a destructive marriage, what a healthy marriage looks like, essential ingredients to a healthy marriage, and how to initiate change within your marriage. This book contains information that can be utilized to change many marriages, and for that reason, it is a recommended read by those walking a rocky marriage path or those trying to guide others upon said path. Blessings are promised to those who hunger and thirst for righteousness. But what does it mean to hunger and thirst for righteousness? Who doesn’t know what it feels like to be hungry or thirsty? Even in the smallest of ways, we understand the feelings surrounding being hungry and thirsty, and when they arrive we strive to do anything within our power to make them vanish. We get a drink. We make a sandwich. We do whatever is within our power to erase that feeling. Hungering and thirsting for righteousness is having this deep powerful desire to feel and experience God. It’s a desire to surrender ourselves over to God. It’s knowing the need to empty our lives of everything else and fill it with the power and presence of God. For those of us who are serious about a relationship with God, this will be our desire. For those of us who are not, this will be of no concern. Lord, help me hunger and thirst for Your presence within my life. 2 Peter 2:21 It would have been better for them not to have known the way of righteousness, than to have known it and then to turn their backs on the sacred command that was passed on to them. Peter was very candid when he stated that those who had begun to falsely bring forth their own religious ideology would have been better off if they had never known the way of righteousness. As they stand before God, they will receive a more complex judgment because of their position, for God holds the teachers of His Word to a higher standard. Those that expound upon the Word of God should not do it for personal gain or personal glory. Those who teach should do so embracing the righteousness of God. Those who teach should personally should hunger and thirst for righteousness, and this will be felt by those they are teaching. Why do you serve God? Why do you teach others the Word of God? Lord, help my heart be void of any personal motive as I strive to bring Your Word into this world. Galatians 2:21 I do not set aside the grace of God, for if righteousness could be gained through the law, Christ died for nothing! How are we saved? Who can be saved? Back in the days of the Bible these were hot topic questions. The Jews believed that they were the chosen ones, thus in order to be saved one had to become a Jew. This held some semblance of truth until Paul was commissioned by God to become the disciple to the Gentiles. Peter partially embraced this, as he was willing to spend time with the Gentiles, but that was only until some of his friends arrived, for that was the moment when he backed away from them to, as we say, save face with his friends. Paul confronted Peter and explained that he was wrong in trying to force the Gentiles to become Jews in order to be saved, for this was not factual. Paul explained that salvation did not come from following the law; it came from the righteous act of Jesus on the cross. Many want to complicate the pathway to salvation, but its simplicity cannot be missed. We are not saved by the law; we are saved because of the shed blood of Jesus. Praise and glory be to God for expressing His love for us in such a manner. Lord, Your shed blood has the power to cleanse my sins. Help me, Lord, openly set all my sins before You. Can there be anything better than experiencing the righteousness of God? As we stay true to God, as we stay true to our faith, as we stay true to the Word of God, we will experience the righteousness of God. The imagery of this verse is beautiful. Who can watch the morning sun break the horizon without feeling the power of God? We are taught that, as we revere the name of the Lord, the sun of righteousness will rise and bring along its healing power. What else could one ask to receive? What else could one ask to experience? For our dedication, God promises to bring changes into our lives, changes into our situations. Could it be any more simple? Lord, help me become a powerfully dedicated servant. Psalm 23:3 he restores my soul. He guides me in paths of righteousness for his names sake. Restoration brings about an amazing feeling within the lives of those who are blessed to experience its presence. The restoration of a marriage breathes new life into the couple. The restoration of a friendship restores hope for the future to those involved. The restoration of a parent-child relationship regenerates the future generations of the entire family. Restoration is powerful, just ask anyone, anyone who has received its blessing. God wants to restore our lives and make them something beautiful, something that contains life changing power, something that will allow us to embrace this world with great news of the gospel of Jesus Christ. Does your soul need restoration? Reach for God, who gives it freely to all who are sincerely seeking it within their lives. Lord, restore me that I might become a reflection of Your image.